Gandhi Institute of Technology and Management popularly known as GITAM University conducts an entrance test name GITAM GAT to check the eligibility of the students willing to seek admission n their prestigious institution. GITAM University offers degree program in engineering and Technology across its campuses located in Hyderabad, Vishakhapatnam and Bengaluru. GITAM GAT 2019 is an online entrance test conducted in the month of April 2019 every year through online mode. The entrance exam is common for all the three, i.e., Vishakhapatnam, Hyderabad and Bengaluru campuses. 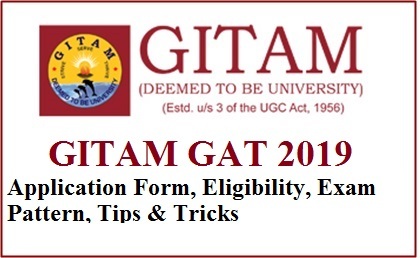 GITAM GAT 2019 application form will be available from through online mode and the eligible candidates can enroll themselves for the entrance exam. Article mentioned below contains the very required details regarding the GITAM GAT 2019 examination. GITAM Admission Test 2019 will be conducted in the month of April 2019, however the registration begins from the November 2018. In the below mentioned table candidates can know the schedules of the entrance exam for the upcoming academic year 2019-2020. GITAM Admission Test 2019 is organized to check the eligibility not only for the B.Tech course, but also for the various other courses such as B.Pharm, B.Arch, M.Tech, M.Arch and M.Pharm. As the eligibility criteria for all the courses varies from one another, the below mentioned article will provide the complete details. Age: GITAM GAT 2019 does not have any kind of age restriction for appearing for exam. Qualification: Different course requires different qualification to appear for GITAM GAT 2019. 60% aggregate in 12th with mandatory subjects like Physics, chemistry and Mathematics. 60% aggregate in 12th with mandatory subjects like Physics, chemistry and Mathematics/Biology. 50% aggregate in 12th with mandatory subjects like Physics, chemistry and Mathematics/Biology. 60% aggregate in engineering from a recognized university. 50% aggregate in B.Arch from a recognized university. 50% aggregate in B.Pharm from a recognized university. GITAM Admission Test 2019 application from will be released by GITAM University through its official website. The application form will be available from the month of November 2018. Candidates willing to appear for entrance exam will have to fill the application form with appropriate details and submit it on time. Registration: Candidates can register for GITAM Admission Test 2019 through online mode from the GITAM official website. Required Details: Candidates should fill the application form with appropriate details such as details regarding his/her identity, qualifications, and contact details. Generation of Login Id: After filling the form the students login Id and password will be generated for further use. Uploading Documents: Candidates should upload the scanned copy of his/her recent passport size photograph and signature. Payment: Candidates can make payment through online mode through net banking/ credit card/debit card. Payment can be made even through offline mode through demand drafts from Indian Bank, Union Bank of India or Karur Vyasa Bank. Submission: After uploading the documents candidates can submit the form and take a print out of a duly filled application from for further reference. In case of online payment, Credit/debit/net banking details are required. GITAM Admission Test 2019 exam pattern describes the type of questions, number of questions, marks allotted for the questions and many more details. Candidates appearing for entrance exam will get proper guidance to prepare and practice for the upcoming examination. Mode of Exam: GITAM Admission Test 2019 will be conducted in both online mode and offline mode. Medium of Exam: GITAM Admission Test 2019 will be conducted only in English medium. Duration of Exam: GITAM Admission Test 2019 will be conducted for 120 minutes, i.e., 2 hours. Format of Exam: GITAM Admission Test 2019 will consist of objective type’s questions. Each question will be provided with 4 options from which the students will have to select the correct answer. No. of Questions: GITAM GAT 2019 test paper will consist of 100 questions in total, divided by each subjects. Marking Scheme: For each correct answer at GITAM GAT 2019, candidates can gain 3 marks. Negative Marking: For every wrong answer given by the candidate, 1 mark will be deducted. Unanswered questions will neither gain nor lose any marks. Total Marks: GITAM GAT 2019 question paper will be set for total 300 marks. GITAM Admission Test 2019 exam syllabus consists of topics and chapter covered under the subjects like Physics, Chemistry, Mathematics and Biology. The syllabus for the exam is based on the topics covered in 12th class. GITAM Admission Test 2019 release it’s admit card in the month of April 2019. Candidates can download the admit card from its official website through online mode. Candidates should keep the admit card until the end of admission process. Mandatorily candidates should carry their admit card to the exam center, if failed he/she will not be allowed to appear for the exam. Visit GITASM GAT 2019 official website and login. Choose a slot from the available slots and submit. Click on generate hall tick and take the print out for further use. GITAM Admission Test 2019 result will be declared by the admission authorities of the university. Candidates should login with their login Id and password to access their results. Visit GITAM GAT 2019 official website and navigate to Results. Provide admit card number and date of birth and click in submit option. Once the result is displayed take a printout of score card for further use. GITAM Admission Test 2019 counseling process begins soon after the declaration of results. The counseling process will be conducted through offline mode and the candidates should be physically present at the time of counseling for document verification and seat allotment purpose. Candidates can download counseling call letter from the official website. Candidate should make the payment of INR 1000/- for the counseling process before the last date. Candidate will not be given an extension of time to pay the university fee. GITAM Admission Test 2019 has established around 50 exam center in various states across India. Candidates can chose their nearby exam center and apply for the entrance exam. Candidates should be physically present at the chosen exam center online at the day of exam.